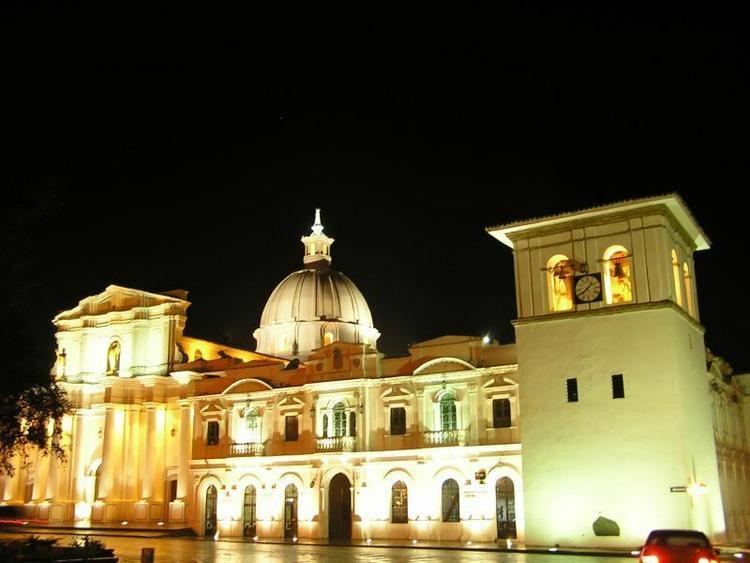 Popayan is the capital of the Colombian department of Cauca. It is located in southwestern Colombia between Colombias Western Mountain Range and Central Mountain Range. It has a population of 258,653 people, a territorial extension of 512 km2, is located 1760 meters above sea level, and has an average temperature of 18/20°C. This town is well-known because of its beautiful colonial architecture and its contributions to Colombian cultural and political life. It is also known as the "white city" due to the color of the most of colonial houses and places in the city downtown, where several churches are located, such as San Francisco, San Jose, Belen, Santo Domingo, San Agustin, and the Catedral Basilica Nuestra Senora de la Asuncion, known locally as "La Catedral". The citys cathedral was home to the Crown of the Andes, a 16th-century Marianist devotional object featuring emeralds taken from the captured Inca Emperor Atahualpa before its sale to finance local health care institutions. Much of the citys original splendor was destroyed on 31 March 1983, when an earthquake toppled many buildings. Though many of them were rebuilt and repaired, the heart of the city still bears ruins and empty lots since the disaster. Popayan has been home to seventeen Colombian presidents, as well as noted poets, painters, and composers. The University of Cauca (est. 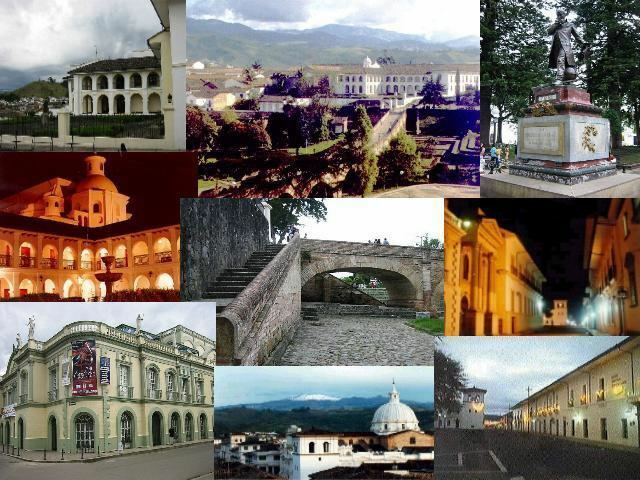 1827), one of Colombias oldest and most distinguished institutions of higher education, is located here; that is why Popayan is also known as the "University City." Nearby is Purace National Natural Park, a geothermal wonderland of hot springs, waterfalls, and an inactive volcano from which the park derives its name. The nearest large city is Cali, in the Valle del Cauca Department, to the north of Cauca. In 2005, Popayan was declared by the UNESCO as the first city of gastronomy because of its variety and meaning to the intangible patrimony of Colombian culture. The culinary history of the Cauca Department was chosen because of their maintaining of traditional methods of food preparation which has been passed over through different generations orally. On 2009 September 28, UNESCO also declared the processions of the Easter Week processions as a Masterpiece of the Oral and Intangible Patrimony of Humanity. 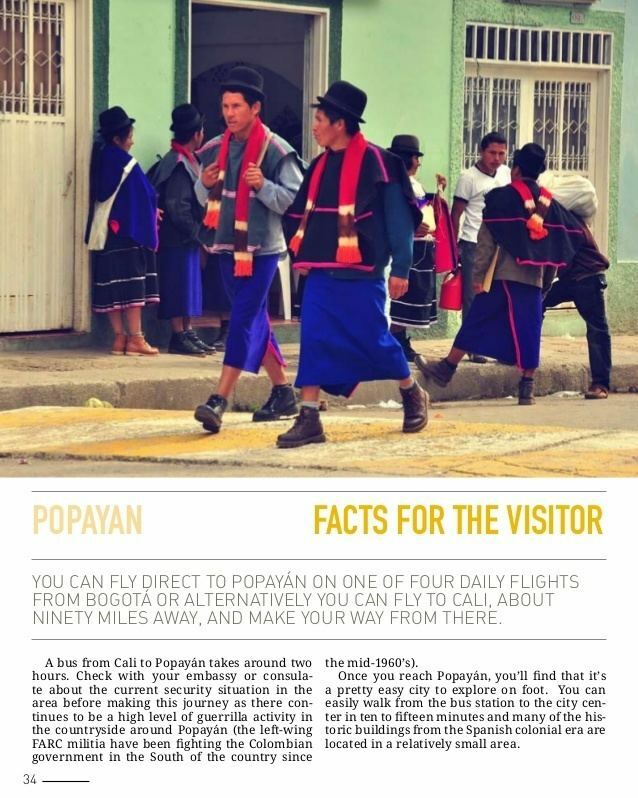 The word Popayan comes from a Native American dialect. There are some theories about the origin of this word, one claims it means: Po: Two; Pa: Straw; Yan: Village, or Two Villages with Straw Roofs. Another theory says that the word Popayan comes from the name of the Payan indigenous leader, who used to live around Eme Hill, nowadays known as Las Tres Cruces Hill. Yet another theory says that according to the historian Arcecio Aragon, the origin of the word Popayan is "Pampayan" and it comes from the Quechua language: pampa (valley) and yan (river), or in other words, the pass of the river, the Cauca river. Popayan is widely known for the solemnity of its Holy Week processions, during which it commemorates the passion and death of Jesus Christ. Since roughly the mid-sixteenth century - documents in the historical archives of Popayan mention processions in the year 1558 - sacred processions have taken place each night from Tuesday until Holy Saturday, with ancient religious images paraded through Popayans historical downtown streets. They are borne on wooden platforms by means of 4 projecting wooden "bars" at the front and 4 at the back. These bars rest on the shoulders of the “Cargueros”, as those responsible for carrying the platforms are known. These processions are representations of different episodes narrated in the Gospels, relating the Passion, Crucifixion and Death of Jesus Christ, each reprsentation is called a "Paso". Since the time of the conquest the pasos have been carried through the streets on the shoulders of the traditional cargueros in a route shaped like a cross, which takes in the main churches and temples of the city. Since 2009 the Popayan Holy Week processions have been inscribed in the UNESCO Intangible Cultural Heritage Lists. During Holy Week, Popayan is also home to the Festival de Musica Religiosa (Religious Music Festival), begun in the 1960s on the initiative of Edmundo Mosquera Troya. This festival presents choirs, soloists and artists from around the world, specialists in sacred music. It is also the tradition at this time of the year to hold art and craft fairs selling handicrafts and commercial products. One of the most important handicrafts samples is Manos de Oro, where it exposes the several works of artists of Colombia.